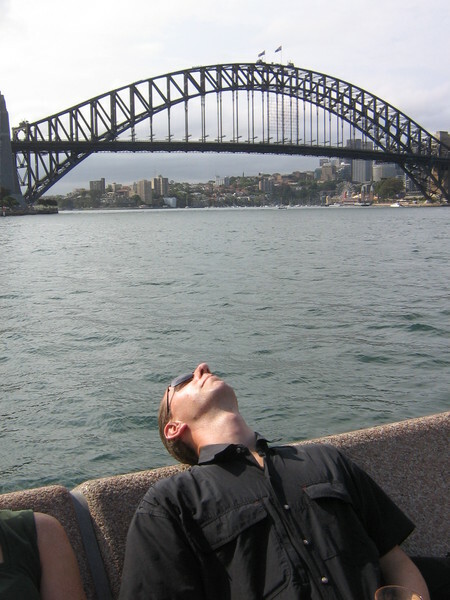 Sydney is one of those cities that you can tell is very nice to live in, but where the touristy things to do aren't necessarily very obvious. It reminds me a bit of San Diego (my current home town) in that respect, and once I started thinking about this, I was struck by the similarities. Both have great beaches and famous zoos. Both also have nearby mountains for hiking and weekend getaways, although I think Sydney's Blue Mountains seem a bit further away than San Diego's Cuayamacas. Perhaps the touristy things to do didn't seem so obvious because we didn't try to pack that much touristing in during our visit to Sydney. We were staying with Hubby's sister and her boyfriend, and visiting time was obviously a priority. We did see and do some cool things, though. We visited the aforementioned Taronga Zoo and admired the marsupials we had never heard of. The zoo has an impressive collection of marsupials, and even the koalas were up and about when we visited. I liked the bilby the best. It looks a bit like a mutant rabbit, with medium-sized ears that poke out of its head at an awkward angle and legs that are just a little bit too short. It is one of those animals that is so ugly it is cute. 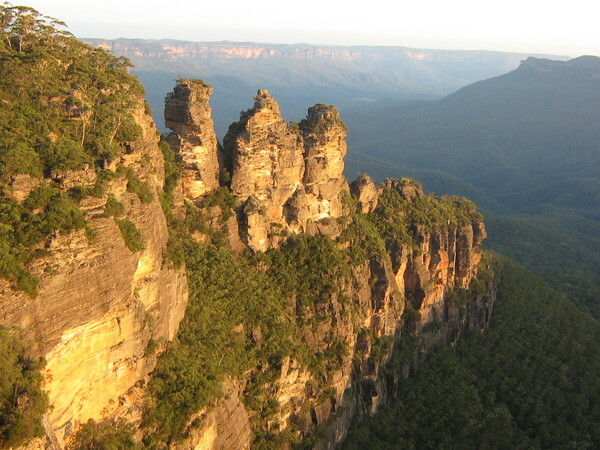 We also spent a night out in the Blue Mountains, where I discovered that Aussies are almost as crazy as Kiwis about hiking up and down things. We stayed in Katoomba, and decided to take a hike down to view the Katoomba Falls. The falls were impressive, as were the 900 or so stairs we had to climb down and then back up (because we missed the last running of the incline railroad that would have taken us back up the hill). It is a measure of how beautiful the area is that I thought the hike was worth it, was still speaking to Hubby at the end of it, and even consented to walk out to see the sunset on the Three Sisters after a rest in the hotel. The Three Sisters are an impressive set of rock outcroppings. They looked amazing in the late light. Two of the coolest things we did in Sydney involved alcohol, which is perhaps not surprising given the Aussie reputation for enjoying their drink. After our visit to the zoo, we met our hosts at the Opera Bar for drinks. The drinks were overpriced and w e were warned off the food altogether, but it has a cool outdoor seating area, and you can't beat the view: the Opera House was in front of us and the Harbour Bridge was behind us. It was a glorious, warm, sunny day, and all seemed right with the world, or at least our little corner of it. The next day, we took a pub tour of the historic Rocks section of Sydney. We weren't sure how good this would be when we signed up, but we figured that at least it would involve a few beers, so it couldn't be all bad. It turned out to be great. We had a an excellent guide, who made up for his non-Aussieness (he was Canadian) by knowing lots of really interesting stories about early Sydney and the history of the buildings we visited. We learned about how unsuspecting sailors would get jumped, clobbered with socks full of sand (so that the incriminating evidence could be poured away), and robbed in the alleys, and about how the marks on the large stone blocks that make up so many of the buildings in the area were put there by the convicts who carved the blocks out of stone, to allow the wardens to see if they were making their quotas. All in all, we really enjoyed our time in Sydney, and I was a bit sad to leave. I was also anxious to see some more of Australia, though, so we loaded up our little rental car, and headed north.